Hover your mouse over the display to reveal data. Ozone is a gas found in different parts of the atmosphere. Ozone in the upper atmosphere, or stratosphere, helps protect the Earth from the sun’s harmful rays. (The Stratospheric Ozone Levels indicator describes trends in stratospheric ozone levels over the U.S.) In the lowest level of the atmosphere, the troposphere, exposure to ozone also can be harmful to both human health and some plants. For this reason, ozone is often described as being “good up high and bad nearby” (U.S. EPA, 2003a). Most ground-level ozone forms in the air from chemical reactions involving nitrogen oxides (NOx), volatile organic compounds (VOCs), and sunlight. Ozone levels are typically highest during the afternoon hours of the summer months, when the influence of direct sunlight is the greatest. These highest levels occur during what is known as the “ozone season,” which includes at least the spring and summer months but whose time frame varies by state (U.S. EPA, 2003b). Variations in weather conditions play an important role in determining ozone levels. Daily temperatures, relative humidity, and wind speed can affect ozone levels. In general, warm dry weather is more conducive to ozone formation than cool wet weather. Wind can affect both the location and concentration of ozone pollution. NOx and VOC emissions can travel hundreds of miles on air currents, forming ozone far from the original emissions sources. Ozone also can travel long distances, affecting areas far downwind. High winds tend to disperse pollutants and can dilute ozone concentrations. However, stagnant conditions or light winds allow pollution levels to build up and become more concentrated. Inhalation exposure to ozone can cause many harmful health effects. Examples include respiratory effects, such as difficulty breathing, coughing, and airway inflammation. For people with lung diseases such as asthma, emphysema, and chronic obstructive pulmonary disease (COPD), these effects can lead to emergency room visits and hospital admissions. Ozone exposure also is likely to cause premature death from lung or heart diseases. In addition, evidence indicates that long-term ozone exposure may lead to the development of asthma and permanent lung damage (U.S. EPA, 2013). People most at risk from breathing air containing ozone include people with asthma, children, older adults, and people who are active outdoors, especially outdoor workers. In addition, people with certain genetic characteristics, and people with reduced intake of certain nutrients, such as vitamins C and E, are at greater risk from ozone exposure. Research also indicates people with certain health conditions, such as obesity or diabetes, may be at increased risk of ozone-related health effects. Elevated concentrations of ozone can also affect some vegetation and ecosystems (U.S. EPA, 2013). This indicator presents ambient ground-level ozone concentrations in parts per million (ppm) from 1978 to 2016. Data are shown for 8-hour averaging times, based on continuous ozone monitoring data and consistent with this pollutant’s National Ambient Air Quality Standard (NAAQS). The 8-hour standard is indicative of exposures occurring over a sustained period of time (e.g., an outdoor worker’s exposure over the course of a work day). Trends for this indicator represent 139 sites in 116 counties nationwide that have data for the period of record in the State and Local Air Monitoring Stations network or by other special purpose monitors. The indicator also displays trends in ozone measurements in each EPA Region. This indicator’s exhibits display the corresponding NAAQS as a point of reference, but the fact that the national or regional concentrations fall below the standard does not mean that all monitoring sites nationally or in any EPA Region also are below the standard. The indicator displays trends in the number of the 139 sites nationwide at which ozone concentrations exceeded the 8-hour standard, but this statistic is not displayed for each EPA Region. Trends in ozone concentrations can be difficult to discern because of the year-to-year variations in the concentrations. By presenting data for rolling 3-year time periods, this indicator smoothes out the “peaks” and “valleys” in the trend, making it easier to see the long-term trend. Three years is consistent with the 3-year period used to assess compliance with the ozone standard. For the 8-hour trends in this report, a 3-year average of the fourth highest daily maximum 8-hour concentration in each year is used to be consistent with the 8-hour ozone standard. Between the 1978-1980 and 2014-2016 averaging periods, nationwide fourth highest daily maximum 8-hour ambient ozone concentrations decreased by 34 percent (Exhibit 1). The 8-hour ozone levels in 2014-2016 were the second lowest on record (Exhibit 1), and the number of trend sites measuring ozone concentrations above the level of the 8-hour NAAQS decreased by 65 percent over the time frame covered in this indicator (Exhibit 2). Among the ten EPA Regions, the most substantial declines in 8-hour levels were observed in EPA Regions that originally had the highest ozone concentrations (EPA Regions 1 and 9) (Exhibit 3). Over nearly the entire period of record, Region 10 showed the lowest Regional ozone levels. Also shown in Exhibit 1 are the 90th and 10th percentiles based on the distribution of statistics at the monitoring sites. This provides additional graphical representation of the variability of measured concentrations across the monitoring sites for a given 3-year period. Thus, the graphic displays the concentration range where 80 percent of measured values occurred for that 3-year period. In summary, despite reductions in ambient concentrations of ozone over the past quarter century and decreases in the emissions of ozone precursors since 1990 (the Nitrogen Oxides Emissions indicator; the VOC Emissions indicator), ozone concentrations above the health-based air quality standards remain one of the most persistent air pollution problems in many parts of the U.S.
Because most monitoring sites are located in urban areas, the trends might not accurately reflect conditions outside the immediate urban monitoring areas. Because of the relatively small number of trend sites in some EPA Regions, the regional trends are subject to greater uncertainty than the national trends. Some EPA Regions with low average concentrations may include areas with high local concentrations, and vice versa. 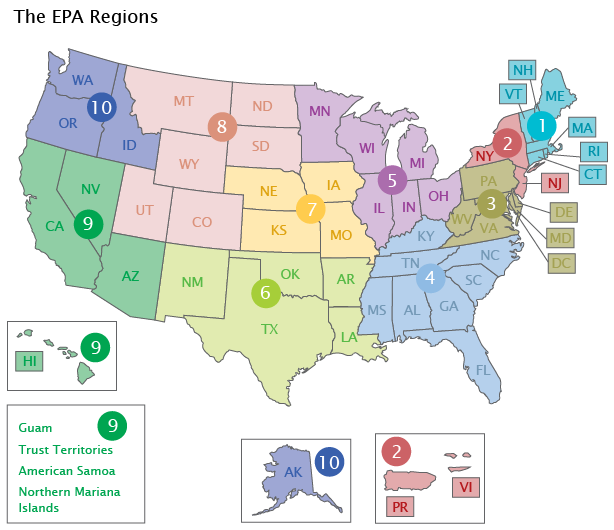 In addition, the 139 trend sites in this indicator are not dispersed uniformly across all states in the EPA Regions. The 139 trend sites are located in 34 states. In the remaining 16 states, there currently are insufficient long-term data from the existing monitoring sites to include in this indicator. To ensure that long-term trends are based on a consistent set of monitoring sites, selection criteria were applied to identify the subset of ozone monitoring sites with sufficient data to assess trends since 1978. Monitoring sites without sufficient data are not included in the trend analysis. Some excluded monitoring sites reported ozone concentrations above the level of the ozone standard over the time frame covered by this indicator. In 2016, for example, 344 sites recorded ozone concentrations above the level of the NAAQS: this includes the 45 trend sites shown in Exhibit 2, and 299 sites that did not have sufficient long-term data to be included in this indicator. Summary data in this indicator were provided by EPA’s Office of Air Quality Planning and Standards, based on ozone ambient air monitoring data in EPA’s Air Quality System (U.S. EPA, 2017a) (https://www.epa.gov/aqs). National and regional trends in this indicator are based on the subset of ozone monitoring stations that have sufficient data to assess trends since 1978. U.S. EPA (United States Environmental Protection Agency). 2017a. Data from the Air Quality System. Accessed 2017. https://www.epa.gov/aqs. U.S. EPA. 2017b. History of the national ambient air quality standards for ozone. Accessed 2017. https://www.epa.gov/ozone-pollution/table-historical-ozone-national-ambient-air-quality-standards-naaqs. U.S. EPA. 2013. Integrated science assessment for ozone and related photochemical oxidants. EPA/600/R-10/076F. Research Triangle Park, NC. https://cfpub.epa.gov/ncea/isa/recordisplay.cfm?deid=247492. U.S. EPA. 2003a. Ozone: Good up high, bad nearby. EPA-451/K-03-001. Washington, DC. https://www3.epa.gov/airnow/gooduphigh/ozone.pdf (PDF) (2 pp, 1.4MB). U.S. EPA. 2003b. Latest findings on national air quality—2002 status and trends. EPA/454/K-03-001. Research Triangle Park, NC. https://nepis.epa.gov/Exe/ZyPDF.cgi/P1003URM.PDF?Dockey=P1003URM.pdf (PDF) (36 pp, 4.4MB).